Gilchrist is a self proclaimed legend! London, November 13 : Former Australian captain and wicket-keeper Adam Gilchrist has claimed himself to be a legend in his newly released autobiography: " Adam Gilchrist: The Man. The Cricketer. The Legend." The Australian, who is known for his famous knock of double century against South Africa, had accumulated runs at an average of more than 47, combining 416 dismissals with the gloves during his test match career. His strike rate is among the highest in the history of both One-day and Test match cricket. Perth, Dec 13 : The International Cricket Council (ICC) Friday inducted Adam Gilchrist into the Cricket Hall of Fame at a simple ceremony during the tea interval of the third Ashes Test match between Australia and England at the Western Australia Cricket Association (WACA) ground here. Gilchrist received his commemorative cap from Cricket Australia (CA) chairman and ICC director Wally Edwards in front of a large and appreciative crowd. England and Wales Cricket Board (ECB) chairman and ICC director Giles Clarke, WACA chairman and vice-president Sam Gannon, and WACA president and ICC Cricket Hall of Famer Dennis Lillee were also present. New Delhi, Nov 12 : Australian great Adam Gilchrist feels Sachin Tendulkar has not overstayed in international cricket and is happy to see the master blaster calling time on his phenomenal career at home. Tendulkar retires after playing his 200th Test against the West Indies starting Thursday. "What Sachin has been contributing to that Indian team is special. It is not just about the runs," said Gilchrist at a promotional event at the Australian High Commission here Tuesday. New Delhi, April 2 : Adam Gilchrist and Darren Lehmann as captain and coach, respectively, of Kings XI Punjab is a big boost for the team's chances in the sixth edition of Indian Premier League. The duo helped the Deccan Chargers win the IPL title in 2009 and Punjab fans will hope they can repeat the feat. The key foreign players in the franchise are Azhar Mahmood, Dimitri Mascarenhas, David Hussey and Luke Pomersbach, who comes back to Punjab from Royal Challengers Bangalore. According to the media reports, former wicket-keeping great Adam Gilchrist has backed Australian bowlers to do well against England after they failed to impress against Ireland and Middlesex batsmen. Australia begins its five-match series of one-day games against England on Tuesday. London, Nov 19 : English county club Middlesex have signed up Adam Gilchrist for next season's Twenty20 Cup and are now looking to get Sachin Tendulkar on board as well. Tendulkar is mulling over the offer to form a dynamic partnership with Gilchrist at the top of the order. But Tendulkar needs an approval from the Board of Control for Cricket in India (BCCI) but the Middlesex chief executive, Vinny Codrington is hopeful of signing up the player soon. New Delhi, Oct 28 : Former Australian wicket-keeper-batsmen Adam Gilchrist feels so much cricket is being played these days that it has led to a "spectator fatigue." Gilchrist, who was here Wednesday as an ambassador for University of Wollongong, said that administrators need to look into the problem of hectic scheduling. The prolific batsman also backed Australian skipper Ricky Ponting's disapproval of the timing of the ongoing seven-match series against India. Chennai, Oct 25 : Former Australian wicketkeeper Adam Gilchrist has said that the seven-match one-day series between India and Australia would be "hard fought". The first game of the series is being played in Vadodra today. The Indian Premier League's (IPL-2) champions, Deccan Chargers has crashed out of the T20 Champions League after losing to Trinidad and Tobago in the last match of the league phase at the Rajiv Gandhi International Stadium in Hyderabad on Wednesday. Deccan Chargers skipper Adam Gilchrist won the toss and elected to field first. Trinidad scored 149 runs for loss of 7 wickets in their allotted 20 overs. W Perkins was top scorer with 38 runs in 32 balls. F Edwards took three wickets for the Deccan. Former Australian wicket-keeper has warned over the issue of day-night test matches as the International Cricket Council (ICC) has cleared the way for first ever day-night test match which will be played next year. In the ICC board meeting at Lord's, it was confirmed that a day-night Test match could be tried out next year if all the factors associated with it were feasible. 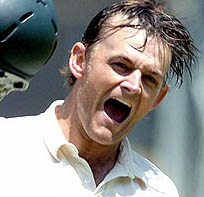 Adam Gilchrist topped the list in terms of value of a player in IPL-2. As Adam led his team towards a glorious victory, he has surprised cricket fans and analysts. Adam scored total 753 runs including batting, bowling and fielding performance conveyed in terms of runs and without including his excellent captaincy skills. Gilchrist scored 583 runs of the bat with bonus of 88 runs bonus for high strike rate and 170 runs for wicket-keeping. A single skill is not enough to be on top, all-round skills are required. Johannesburg (S. Africa), May 25 : Deccan Chargers skipper and former Australian wicketkeeper Adam Gilchrist on Sunday hailed all-rounder Andrew Symonds as a "great team man" after the team was declared the 2009 Indian Premier League champions. The Deccan Chargers beat the Royal Challengers Bangalore by six runs in an exciting final. Melbourne, Apr 12 : Adam Gilchrist has backed Indian Premier League teammate Andrew Symonds to continue his rebirth and force his way into Australia''s squad for the Ashes. Symonds has been picked in Australia''s one-day squad for the upcoming series against Pakistan and the preliminary squad for the Twenty20 World Cup in signs the selectors are willing to forgive his tumultuous summer. Gilchrist believes the troubled match winner''s Test career is not over either. Symonds has not represented his country since the Boxing Day Test against South Africa. London, Apr. 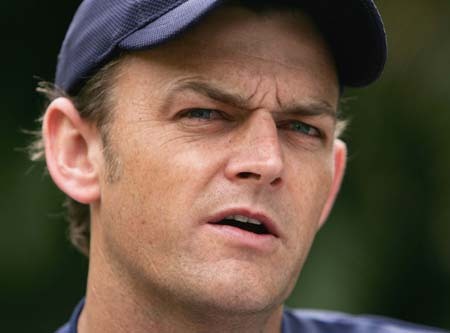 1 : Former Australian wicketkeeper Adam Gilchrist will give the 2009 MCC Spirit of Cricket Cowdrey Lecture at Lord''s on June 24. The 37-year-old, still playing Twenty20 cricket for Indian Premier League side Deccan Chargers, will be the youngest person to give the lecture, established in 2001 in memory of former England captain Colin Cowdrey. Gilchrist was on the winning side in 73 of his 96 Tests, the last of which he played in 2008, and was a key member of the all-conquering Australia team which has dominated world cricket since the late 1990s. Perth, Jan. 20 : Former Australian wicketkeeper-batsman Adam Gilchrist has urged New South Wales batsman David Warner to learn to relax first, and said that once he does that, the runs will flow again. Gilchrist, who played 287 one-day internationals during his nearly decade-long career, was quoted by Fox Sports as saying: "Don''t put too much pressure on yourself, I always felt that pressure came from within, it is not a matter of the headlines or the air time that you received." London, Nov 5 : Adam Gilchrist has warned England’s that after their flop show at 20million dollar Stanford series they will face more misery in the Ashes next summer. The retirement of the legendary wicketkeeper, along with Shane Warne and Glenn McGrath, sparked talk of an Australian decline. After Adam Gilchrist's remarks over Sachin Tendulkar's honesty on the famous ''Monkeygate'' issue provoked angry reactions from Indian cricketing fraternity, the Indian batting maestro said the Australian called him up to clarify the whole issue and added that the matter was blown out of proportion. “He said his comments have been taken out of context,” added Tendulkar. However, the master-blaster batsman refused to comment any further on the issue. Sydney, Nov. 14: Australian wicketkeeper-batsman Adam Gilchrist has been named Australia's greatest one-day international cricketer of all-time. Gilchrist, on his 36th birthday, was handed the honour by his peers, with all 163 players to have represented Australia in ODIs invited to vote on the best, reports Fox Sports. In total, 110 players voted and Gilchrist won comfortably with 38 per cent of the poll from his captain Ricky Ponting (19 per cent) and former skipper Steve Waugh(14 per cent). Three-time World Cup winner Gilchrist received the honour at an Australian Cricketers' Association (ACA) function at Bellerive Oval in Hobart on Wednesday, where the second Test against Sri Lanka starts on Friday. Sydney, Nov 6 : Australian vice-captain Sydney, Nov 6 : Australian vice-captain Adam Gilchrist has hinted that he might bid adieu to international cricket at the end of this season. Revealing that he had pondered retirement during the last season's Ashes series, the swashbuckling wicketkeeper-batsman said that he was uncertain whether he would continue playing in the next season.